Northwest Missouri State University on today commemorated the 25th anniversary of its designation as the state of Missouri’s official arboretum by planting a tree and celebrating two other trees that now have the designation of state champion trees. 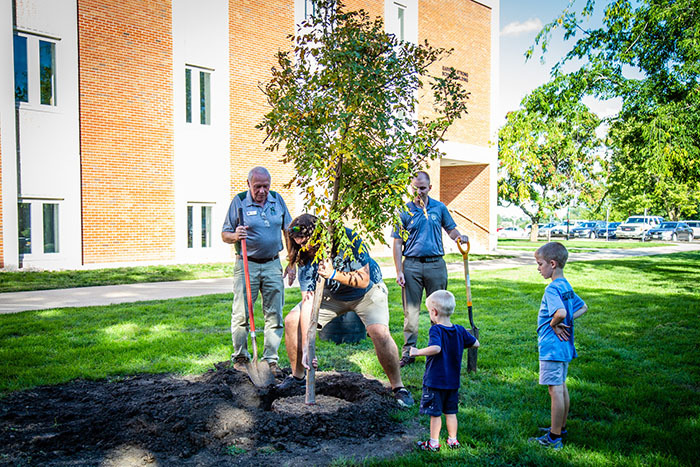 Community members, faculty, staff and students gathered as Pat Ward, the director of the Missouri Arboretum, and members of Northwest’s landscape team planted a golden rain tree outside the south entrance of the Garrett-Strong Science Building on the University campus. The Missouri State Legislature designated the Northwest campus as the Missouri Arboretum in 1993. Today, the campus is home to more than 1,700 trees and more than 160 species cultivated from throughout the world. Three trails – the Gaunt Trail, Tower Trail and Chataqua Trail – traverse the campus to help visitors learn about the trees and get an up-close view of them. During an afternoon program at Garrett-Strong that preceded the tree-planting, Ward noted the health benefits of spending time in green spaces and discussed plans to enhance the Missouri Arboretum by developing additional research projects with faculty and students and the continued planting of both native and non-native species. This summer, two trees in the University’s collection received recognition from the Missouri Department of Conservation as the largest trees of their kind in the state. An Overcup Oak measuring 64 feet tall with a 76-foot spread was named the state champion, and an American yellowwood, measuring 40 feet tall with a 53-foot spread, is a co-state champion. Both are located between the B.D. Owens Library and Garrett-Strong. Today’s program also featured Robert Hendrickson speaking about his work starting and servicing large garden centers and Steve Bailey, a plant and soil science expert who discussed his hobby of collecting and cultivating bonsai trees.